Where are some good Seattle parks? There are over 430 Seattle parks and open areas according to the Seattle Parks and Recreation Department, as well as 115 state parks throughout Washington. Being a tourist in Seattle can be pretty exciting. There is always something to do or somewhere to go or a new place to eat at. Sometimes, though, when you're traveling with kids, it can be easy for them to get worn out or even bored by some of the stuff that you might be interested. That is where the many Seattle open areas really come into play. One of the best things about the parks in Seattle is the fact that many of them are located in places that you might frequent as a Seattle tourist. What this does is give you and your family a place to go and relax for a bit after you've spent a few hours running around either shopping in Bellevue (Bellevue City Park is right next to the mall in downtown Bellevue) or checking out the various Seattle attractions you'll find everywhere. We have only been to a handful of the parks in the region but every single one of them has been an excellent place for us to regroup and relax while the kids play. They love it and we love and it gives us energy to go and do something else that we might want to do later. 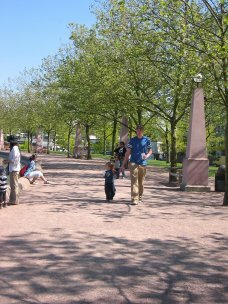 Another thing about the many parks in the Seattle area is that there are some that offer a really unique setting; they're not all just park benches and playgrounds. 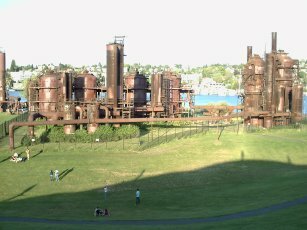 For example, you've got everything from Gasworks Park in Fremont (where the rusted remains of a factory are still standing) to St. Edwards State Park, which was once a Catholic Seminary, as well as Log Boom Park in Kenmore. All in all, I've never seen more beautiful and wonderfully maintained parks as I have in Seattle, and we've now made visiting at least one park a requisite on our journeys back there. What's your favorite park in Seattle? Do you have a favorite park? Share it! Never ending discoveries of new trails and routes await at Discovery Park in Seattle.